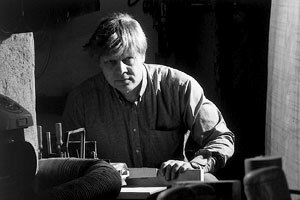 We were sad to learn of the death of basketmaker, woodworker, author and friend, Markku Kosonen, on September 7, 2010. We first saw Markku's baskets of willow in The Language of Wood exhibition at the American Craft Museum (now Museum of Arts and Design) in New York in 1988. We arranged to exhibit his baskets, wood boxes and platters in 1991. That show inspired browngrotta arts' first catalog, Markku Kosonen: Baskets and Woodwork, 12 paqes of black-and-white photographs. In subsequent years, we have featured Markku's work in numerous exhibitions, including in an installation at the Consulate General of Finland in New York; Helena Hernmarck and Markku Kosonen; A Scandinavian Sensibility (which traveled to the North Dakota Museum of Art) (both of which included catalogs); and Eco-Art: Materials Re-cycled, Re-Purposed, Re-Envisioned. Markku's work was included in numerous international exhibitions including Contemporary International Basketmaking, which traveled throughout the UK, Weaving the World; Contemporary Art of Linear Construction at the Yokohama Museum of Art, Japan and one-person exhibitions at the Savonlinna Art Museum, Finland and the Konsthantverkarna in Stockholm, Sweden. His work is in the permanent collections of the Design Museum (Museum of Applied Arts) Helsinki, Finland; National Museum, Stockholm, Sweden; and the Applied Art Museum, Frankfurt am Main, Germany. He was awarded a 3-year State Artist Grant from Finland in 1985, a 15-year State Artist Grant in 1992 and the Alvar Aalto Foundation Artek Prize in 1991. Markku authored several articles and books, including Paju/Willow (1991) and Curly Birch (2004). He wrote eloquently, as in this passage, about trees and wood and nature and life: "Man's problem is awareness of death and a longing for eternity. It is introduced in such strong measure in objects that the conflict is often striking. The fear of change is crystalized as an undue emphasis on durability. Nonetheless, we want to see the marks of life on objects, to admire old worn surfaces, the aging of a natural material and the creation of a patina. This message from one person to another, reaching beyond generations, is communication with the language of objects. It is required by the human condition." Mariette Rousseau-Vermette and her husband, Claude Vermette, played a singular role in our lives. Mariette’s luminous tapestries, among the first works represented by what would become browngrotta arts, sparked our interest in fiber art. 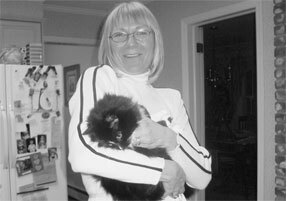 For more than 20 years she nurtured that spark as it grew into a consuming passion – always there with her good judgment and gentle humor. Her keen aesthetic, sense of perfection and endless energy are driving forces behind every exhibit we organize. At our wedding, she was there with soft woolen ties, handwoven for the groom and the groomsmen, one of whom was Claude. When our son Carter was born, it was Mariette's Carter's Color Lesson – a series of multicolored woven tubes – that delighted him as he lay in his crib. At the couple's lakeside home in St. Adele, Quebec, Mariette was the consummate hostess for legions of visitors while at the same time running her studio, creating art for collectors and commissions throughout Canada and the US, including at the Canadian Broadcasting Corporation, the Canadian Chancery, Exxon Corporation and the Kennedy Center (a curtain gifted by the Canadian Government). She had studied at Quebec's School of Fine Arts and with Dorothy Liebes in California and had participated in five of the International Tapestry Biennials in Lausanne, which she later explained "offered me and other artists the chance to communicate with the world." Then there were the years crisscrossing Canada, first as part of the Art and Architecture program, later as head of the Fibers Department, at the Banff Center for the Fine Arts. In the meantime, her work was acquired by major musueums in Canada and abroad, including the Metropolitan Museum of Arts, the Art Institute of Chicago, and the National Museum of Modern Art, Kyoto. She was recognized in her own country, too, with the Certificate of Honor from the Canadian Conference of the Arts, as a member of the Royal Canadian Academy of the Arts and as an Officer of the Order of Canada. But she always made time for her family – her husband, her two sons, her brothers, sisters, nieces, nephews, and grandson – and her many, many friends. We were privileged to be among that cherished group. Claude, like his wife Mariette Rousseau-Vermette, was a friend and inspiration as well as an acclaimed artist. 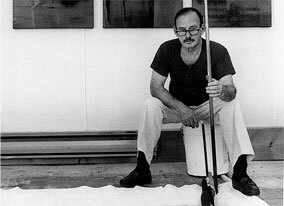 Claude was made a member of the Royal Academy of Canada in 1973. He began formal study of painting at age 14 under Paul-Émile Borduas. He developed an interest in ceramics, studying in France, Spain, Portugal, Belgium, Switzerland, Holland and Italy. A visit to Japan provided further inspiration. A 30-year career in architectural ceramics followed, producing well-known murals in 12 of Montréal's subway stations, airports, courthouses and corporate spaces. In the 1980s, Claude's attentions returned to painting. His paintings are found in numerous private and corporate collections, including Bell Canada in Toronto and Hoffman BMW in New Jersey. Claude's paintings featured clean lines and pure color. The contrasting bands of textured color that characterize his work create a strictly two-dimensional geometry where pictorial elements – color, texture, form and line – are integrated into a whole. "In doing research for the substance of my canvasses," he once explained,"I aim for balance, serenity and simplicity." He lived his life much the same way, his quick humor a memorable part of that blend. 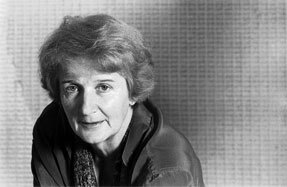 Valerie Pragnell, although English by birth, adopted Scotland as her home and attained international recognition for her art in the 1980s and 1990s. Valerie used natural materials such as bark, branches, mud, moss, thorns, seeds and leaves to create sculptures that addressed the increasingly fragile relationship humans have with the natural world. Valerie created living installations, as baskets and other sculptures often woven into pod-like forms that alluded to fertility, birth and the sheer beauty of simple materials. With an expert eye, she would scour the shorelines and meadows for materials. She would take to her studio an abandoned tangle of barbed wire coated in sheep’s wool or a clump of knotted fishing line in orange or blue where they would be dissected and re-presented as part of a powerful work. Valerie travelled as her reputation spread beyond Scotland. She visited Japan in 1992, supported by the British Council, completing an installation and exhibition with Maseo Ueno at Miyoshi Village in Chiba prefecture, west of Tokyo. Pragnell also undertook site-specific work in Sweden, Finland, Belgium and Germany. She made several trips to the US, where appreciation of her work was growing. She visited us in Wilton when the Across the Pond catalog was completed. We learned a great deal about her work on that trip and about her keen intelligence and love of laughter. 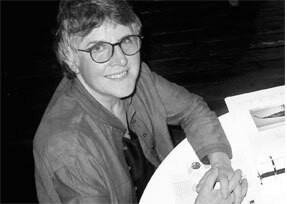 Carol Dean Krute was curator of costume and textiles for the Wadsworth Atheneum Museum of Art in Hartford, Connecticut for 15 years until September 2005. Krute was a combination of a scholar, storyteller and detective as she brought collections to life in the museum's compact costume gallery. She scored a coup when she found one of only six petal stoles created by American haute couture designer Charles James. She cultivated a small but choice collection of contemporary fiber art for the museum, which includes works by Anni Albers, Olga de Amaral, Ferne Jacobs, Jack Lenor Larsen, Gerhardt Knodel, Caroline Mazloomi, Sheila Hicks, John McQueen, Norma Minkowitz and Ed Rossbach. 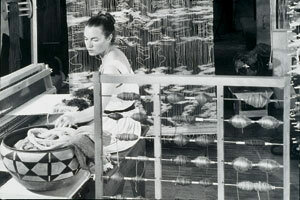 In 2000, through browngrotta arts, she added two works by Lenore Tawney to the Wadsworth collection, Blue Fountain done in 1964 and Drawing in Air #13 from 1997, in which Tawney transfigured earlier the two-dimensional drawing into a three-dimensional sculpture of thread.